Last week I had my most successful forage yet. 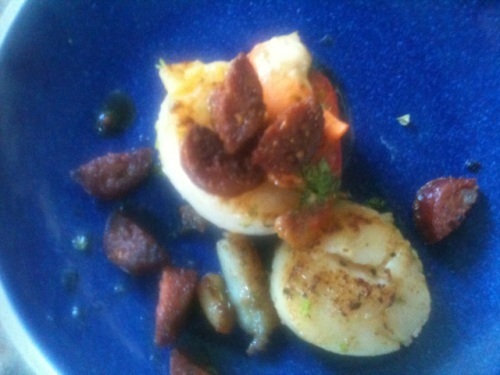 Scallops. Yes, seven fat scallops plucked from the bottom of the sea with my very own hands. These succulent sweet beasties have always been at the top of my foraging list. Not only because they’re utterly delicious, but because I love the notion of diving down through the crystal clear water of the loch to nab them. I’d tried last year, but without a wetsuit those crystal clear waters are unbearably icy. I tried again later in the year with some friends. We ploughed backward and forward across the bay, scanning the seabed. But it was bare, the only signs of life the bulging red jellyfish trailing feathery manes of tentacles. They loomed from the shadows like fleshy ghouls and soon scared us off. My neighbour’s as keen as me to catch a scallop. We’ve often discussed tactics and hatched plans over a cup of tea. He remembers diving in the bay in front as a lad and scooping them up by the dozen. He’d used scuba gear back then, but he reckoned we’d be able to freedive for them – particularly at low tide. So on a glorious morning, we squeezed into our wetsuits and set off round the coast. The loch twinkled, the sky was blue and the grumble and splutter of the outboard was the only sound in the sleepy sunny calm. We were heading to a tiny cove that my family have always called – rather unimaginatively – Wee Bay. It’s a fine spot, protected at one side by a rocky peninsula and fringed on the other by a lovely old oak wood. The shoreline is scruffy with flotsam and jetsam and bits of blue rope, but the bottom is sandy and the water translucent. I floated on the surface. Sunlight streamed into the watery world. Hermit crabs scuttled, shadows of tiny fish flickered and a few lone sea laces waved in the ebb and flow. I listened to the burbling breath, steady and loud in my underwater ears. My neighbour was the first to bag a scallop. I got to work and soon spotted my first victim – a small sandy coloured mound about three metres below. The shell was slightly open and I’m sure I could see its string of beady eyes. I dived down, ears popping as I neared my quarry, fighting the pull upwards to reach out and grab it. I shot to the surface, and emerged, triumphant, holding my booty aloft, slightly deaf and cackling with joy in the sunshine. It was a huge, heavy King scallop. I was ridiculously elated and ready to catch more. 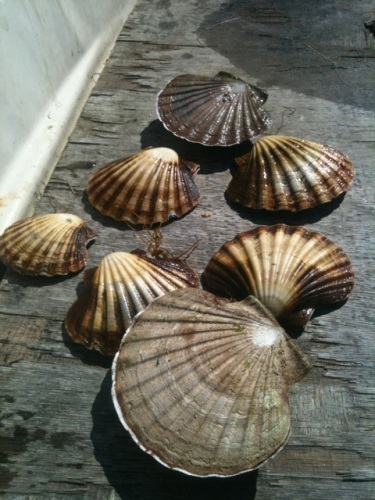 As we ambled back in the boat, I lay the scallops in a row in order of size. They were all pretty enormous. They sneezed and exhaled and, every now and again, opened their shells for a peek. Preparing them was slightly more challenging than I’d imagined – it took an effort to ease the shells open and there are bits and bobs you need to remove. It was, of course, more than worth it. Seared with chorizo, parsley and lemon juice they were, quite possibly, the freshest, tastiest and most tender thing I’ve ever eaten. There’s a good video about cleaning live scallops on the BBC’s website.